Stones in the kidney or urinary tract (nephrolithiasis or urolithiasis, both synonymous) often present as a medical emergency. Those afflicted seek help because of excruciating pain and other complications. Though not common, there are various ways for these stones to form. The options for treatment, however, are generally the same. Calcium stones, mainly calcium oxalate, are the most common type of renal calculus. They can form when one doesn't drink enough water, allowing calcium that would dissolve to instead precipitate and crystallize. They also form in association with conditions raising the blood calcium level, including hyperparathyroidism, cancer, vitamin D overdose, and sarcoidosis. Other factors involve oxalate and citrate. Too much dietary oxalate or conditions increasing intestinal absorption of oxalate can promote stone formation. Citrate plays a role when there is too little of it, because it normally binds calcium and prevents crystallization into stones. Uric acid stones can form with excessive ingestion of purines, primarily from meats. In addition, urine that is more acidic allows uric acid to crystallize more easily. Other types of stones include struvite stones formed through urinary tract infections by urea-splitting bacteria (e.g., Proteus mirabilis), cysteine stones from a rare genetic condition resulting in high levels of blood cysteine, and drug-induced calculi from certain medications that can crystallize within the urinary tract (e.g., the anti-HIV drug indinavir). A calculus within the urinary tract triggers intense pain. One may feel it in the flank if the stone resides in the kidney itself. If the stone advances down the ureter, pain is felt in the abdomen or groin depending on the stone's location. Trauma can cause bleeding seen in the urine itself (hematuria). If the stone reaches the urinary bladder and causes outflow obstruction, one may have pain in the lower abdomen and frequent urges to urinate. On occasion, the stone is a large irregularly shaped stone that fills the space within the kidney (staghorn calculus). As a result, one may have signs of infection, like fever and low blood pressure, rather than pain. 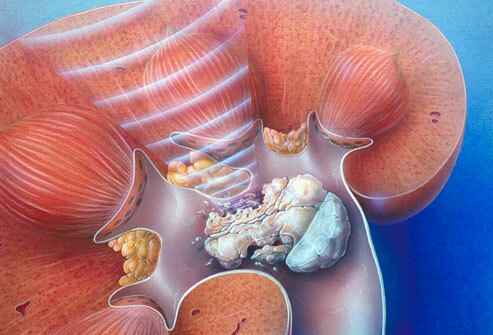 The prime imaging study to diagnose nephrolithiasis is a CT scan of the abdomen and pelvis. Abdominal x-rays can detect calcium stones since they light up well, but not the other types of stones. Ultrasound of the kidneys can demonstrate urine backing up in the urinary tract (hydronephrosis), but it's not always seen, particularly when the stone is small and nonobstructing. Other tests for nephrolithiasis include urinalysis to detect blood, complete blood count to look for signs of infection, and serum chemistries to detect abnormalities in kidney function and electrolyte levels that may suggest a particular cause for the stone. The first step is to relieve any urinary obstruction. If the obstruction is in the bladder, a Foley catheter is inserted through the urethra to drain the urine. If obstruction involves the ureter and urine is backed up all the way to the kidneys, a nephrostomy tube is inserted directly through the skin and into the kidney to drain the urine. As for the stone itself, treatment depends on its size. If it's small, like less than 5 mm, the patient may be given medications to help relax smooth muscle in the ureter and aid in passage of the stone (e.g., Hytrin, Flomax). For stones that are larger and are unable to pass, options include breaking the stone with shock waves (extracorporeal shock-wave lithotripsy or ESWL), inserting a tube through the urethra and all the way to the stone in the ureter in order to extract it with tools (ureteroscopy), and surgically opening the kidney (nephrolithotomy). The urgency of these urological procedures depends on the severity of symptoms. For the most part, they can be done at a urology follow-up appointment after hospitalization. Once that is taken care of, analysis of the stone is done to determine its composition. From there, the underlying conditions that led to the stone are addressed.